The flag consists of a blue background with the university seal, also rendered in blue, on a large white disk. The seal is placed within a ring bearing blue words "THE . UNIVERSITY . OF . NEW . HAMPSHIRE / . 1923 ." where (.) represents a hovering dot. The arms proper are azure an oil lamp argent, and issuant from the "crest" (a chain, really) a bowed arm azure holding a hammer also azure. To the left of the crest appears the year "1866" and to the right of it "1893", both blue. At left, right, and under the shield are placed blue laurels while a white motto on blue proclaims: "SCIENCE / ARTS / INDUSTRY". 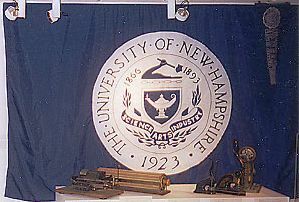 "The University抯 seal marks the transformation of the New Hampshire College of Agriculture and the Mechanic Arts into the University of New Hampshire. The seal depicts a respect for ancient academic traditions along with the tremendous ambition and enthusiasm of that year�23. There are two other dates on the seal: the date the University was founded, as the New Hampshire College of Agriculture and the Mechanic Arts, in Hanover�66; and the date the college moved to its Durham campus�93." 3.1 The distinctive UNH flag will be flown at half-staff (below the American flag) on the Thompson Hall flagpole upon the death of a member of the University community (student, faculty, administrative, or staff member) or a UNH alumnus killed in wartime. On such occasions the flag will be flown at half-staff for a period of three consecutive days. The American flag will be at full staff unless the occasion coincides with a declared period of national or state mourning. In this instance, the American flag will be flown at half-staff with the University flag directly beneath it. 3.2 The UNH flag is to be flown at full staff (immediately below the American flag) on the Thompson Hall flagpole on formal University "days," i.e., commencement, alumni reunion weekends, parents' day, honors' day, etc. The President's office can determine other occasions when the UNH flag will be flown. The first three campus flagpoles were made from trees taken from the College Woods. It was necessary to replace the pole every 20-25 years or so since no matter how the wood was treated, the part that came in contact with the ground would eventually rot. This portion is all that remains of the 1943 flagpole, which once stood 101 feet high. The pole was designed to resemble a ship's main mast, symbolizing the historic significance of New Hampshire's eighteenth-century industry, ship building. It was a gift to the University from R.O.T.C. and Scabbard and Blade.